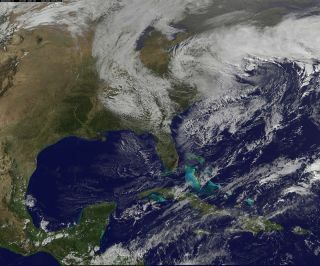 NOAA's GOES-13 satellite captured this visible light image of the nor'easter on Nov. 7, 2012. The nor'easter that dumped record snows on the Northeast yesterday (Nov. 7) was captured from above by NOAA's GOES-13 satellite. The storm broke snowfall records across the region, with 13.5 inches (34 centimeters) reported in Clintonville, Conn.; 4.3 inches (11 cm) in New York's Central Park; and 5.7 inches (14 cm) in Newark, N.J. The National Weather Service predicted the nor'easter will strengthen as it moves north along the coast today. This will bring a mix of rain and snow to the region, with wind gusts as high as 60 mph (96 kph) along the coast, the NWS said. Snowfall in interior New England could approach 6 to 12 inches (15 to 30 cm).Many homes were still without power after Hurricane Sandy when the nor'easter dropped temperatures, and the storm's gusts knocked out electricity to thousands more overnight. Though there were no mandatory evacuations, government agencies were concerned about a repeat of flooding from storm-driven waves. The lack of protective dunes and damage to sea walls following Sandy has made coastal communities increasingly vulnerable to winter storms, even ones that don't approach Sandy's strength.